A cost effective path to a new ship, yacht or boat design. Full design services including surveying, code compliance and stability calculations are provided. All aspects of hull, engineering and electrical marine design are available backed up by 25 years of hands-on experience. 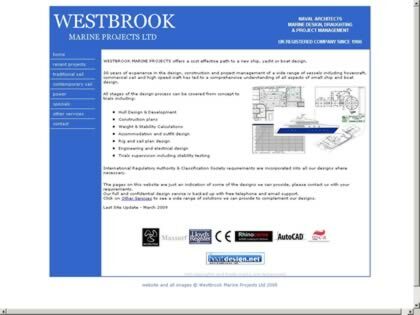 Web Site Snapshot: If available, above is a snapshot of the Westbrook Marine Projects Ltd web site at http://www.westbrookmarine.co.uk as it appeared when this site was added to the directory or last verified. Please Note that Boat Design Net has no involvement with the above web site; all content and images depicted in the above thumbnail are the property and copyright of Westbrook Marine Projects Ltd unless otherwise noted on that site. Description: A cost effective path to a new ship, yacht or boat design. Full design services including surveying, code compliance and stability calculations are provided. All aspects of hull, engineering and electrical marine design are available backed up by 25 years of hands-on experience.